Bronson Speed Co. RAW Shieldless Bearings. Shieldless design: The first bearings on the market with no shields. Designed to let dirt and dust out of the bearings. Audible Speed Technology: Designed to enhance the sound of speed! These things make a slight noise that increases when you're rolling fast. 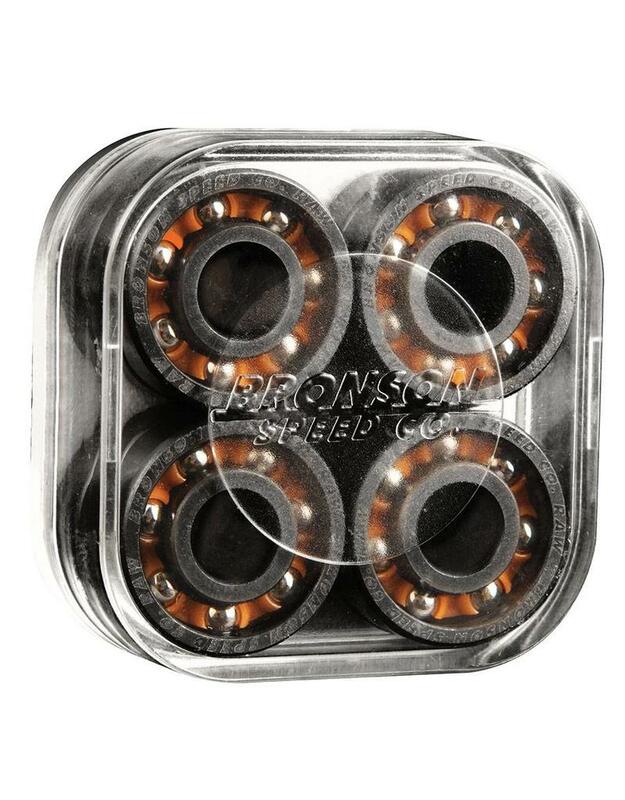 Maximum Impact Cage: The orange cages in these bearings do more than look good! These are super tough fiber glass filled nylan cages, this gives them a super high wear resistance. Deep Groove Raceways: This is my favourite part of the whole design... The balls sit deeper into the races on the bearings giving them more strength for side impacts caused by skateboarding. Factory Fresh: These bearings get hand inspected twice and solvent washed 3 times before packaging. Then they get vacuum sealed in nitrogen to stop oxidization between the metal and oil, so they are always fresh even if they sat on the shelf for a while.